When it comes to decorating the house for Noel, the pine cone Christmas crafts are commonly used by many. And do you know what’s the best thing about the pine cones? They are absolutely free! You can easily find them at this time of the year if you take a short walk in the nearest forest. Once you’ve gathered a bag of pine cones (be sure to collect them in various sizes), start with cleaning them and preparing them for crafting! 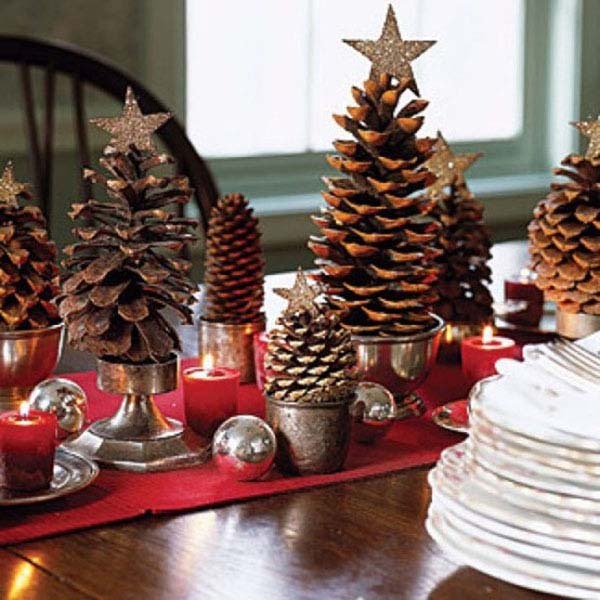 However, there are lots of pine cone Christmas tree crafts on Pinterest, I really like this idea because it can be a nice, cheery touch to the festive dinner table. 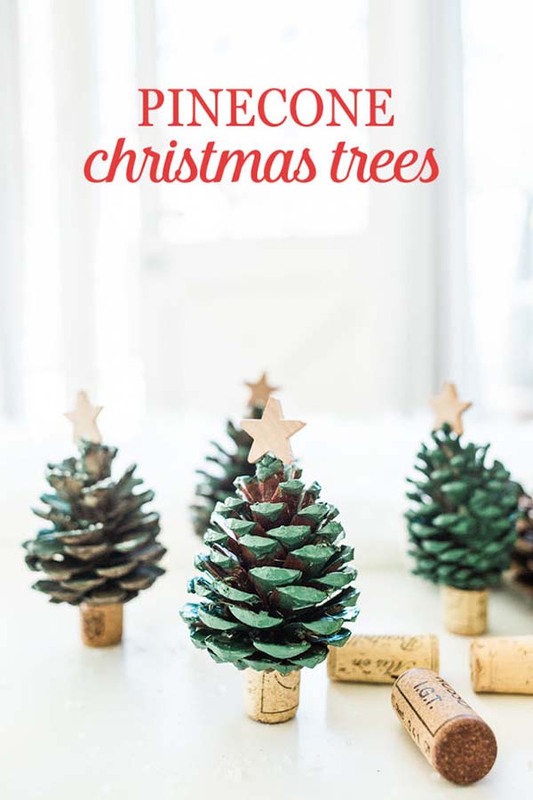 All you need for this project are acrylic paints of your choice, some pine cones, wine corks, and some decorative Christmas tree toppers (I’d display something more unusual than the classic star). Artificial red berries, bells, and sparkling ribbons – that’s what this beautiful DIY Christmas tree ornament is made of. It looks like the ideal way of lightening up your festive tree this year with some large artificially frosted pinecones. These colorful DIY holiday elves, inspired by the Scandinavian culture, are the best pine cone crafts, especially when involving the kids. 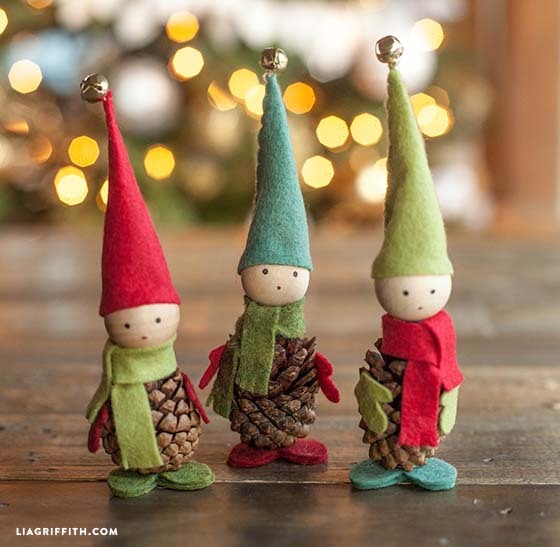 All you need for these cute elfins are a bunch of mini pine cones, 1-inch wood beads, the smallest jingle bells from the nearest craft store, and a pair of scissors and hot glue. 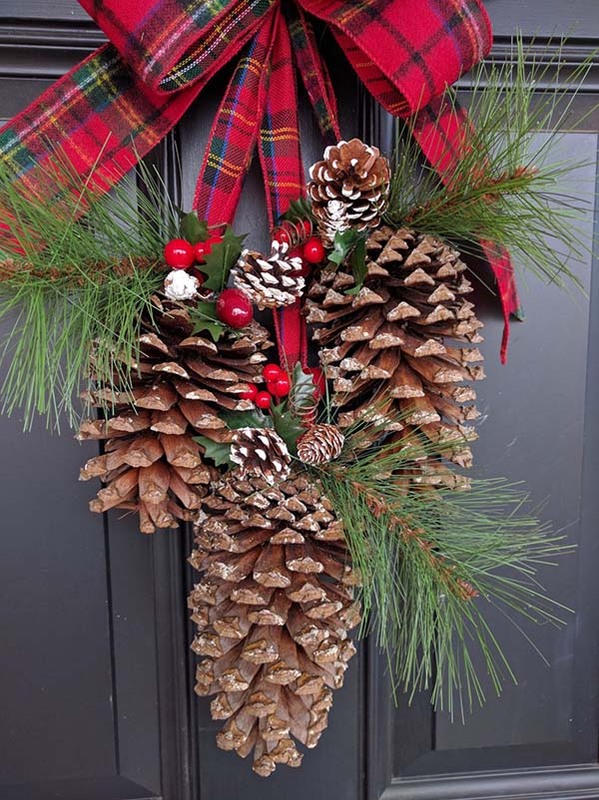 If you are a fan of the farmhouse DIY pine cone crafts, this Christmas, why don’t you design a rustically chic wreath that complements your front door decor? Hot-glue pinecones to a grapevine base and let it dry well. 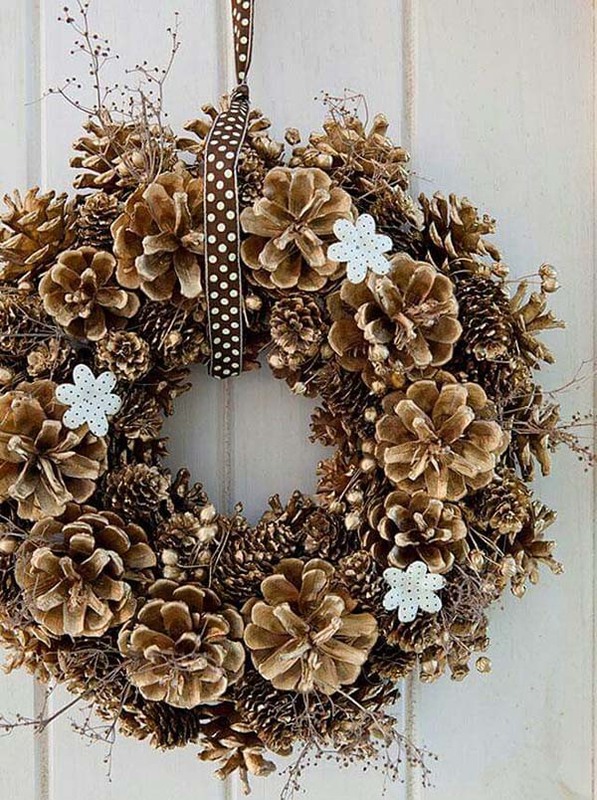 If you want, paint the wreath in a hue that harmonizes with the rest of the design. 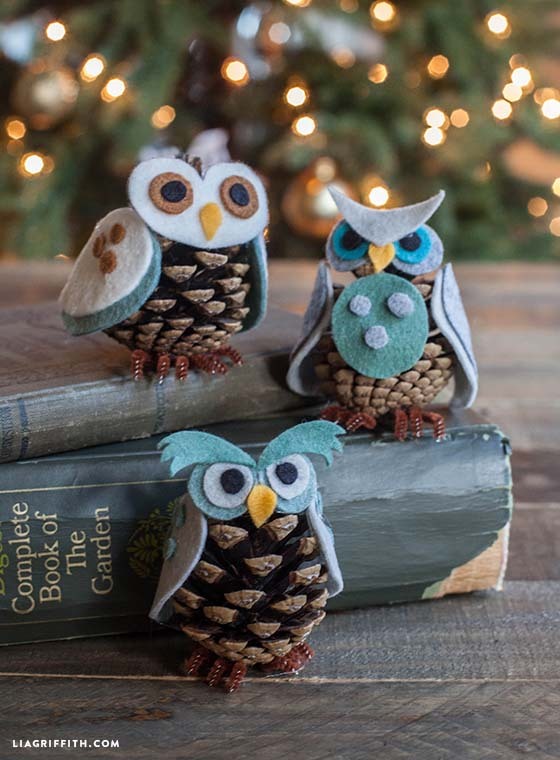 These adorable handmade little pine cone owl Christmas tree ornaments come with different personalities, are one of the best pine cone ornament crafts I’ve ever seen! You customize this project by mixing and matching felt patterns to make your own unique little characters. 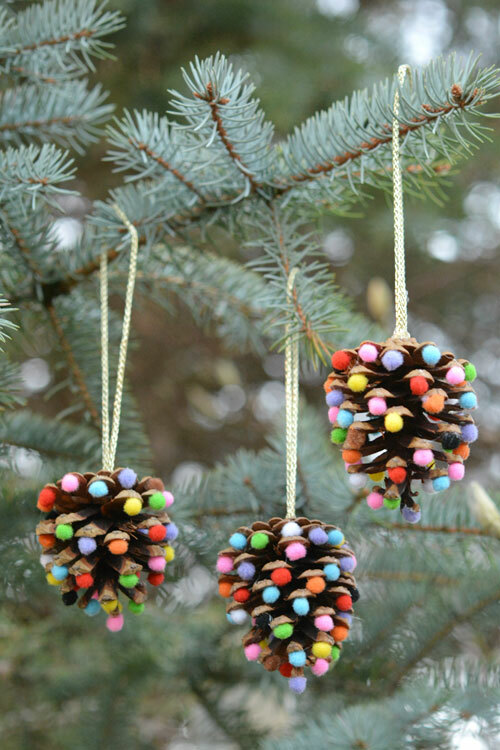 Unfortunately, some of the most popular pine cone crafts are very time-consuming and need some deep crafting skills. But not this one! 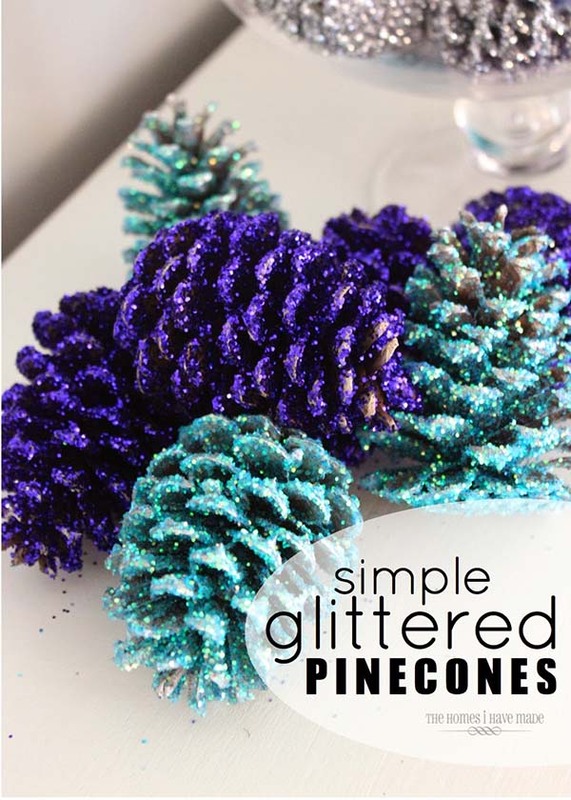 Gather a few of these easy-to-make glittery pinecones, painted in two different pinecones, in a bowl on the festive dinner table for a captivating holiday decoration. Need a Christmas pine cone crafts ideas that take less than 10 minutes to make and won’t need much money for supplies? 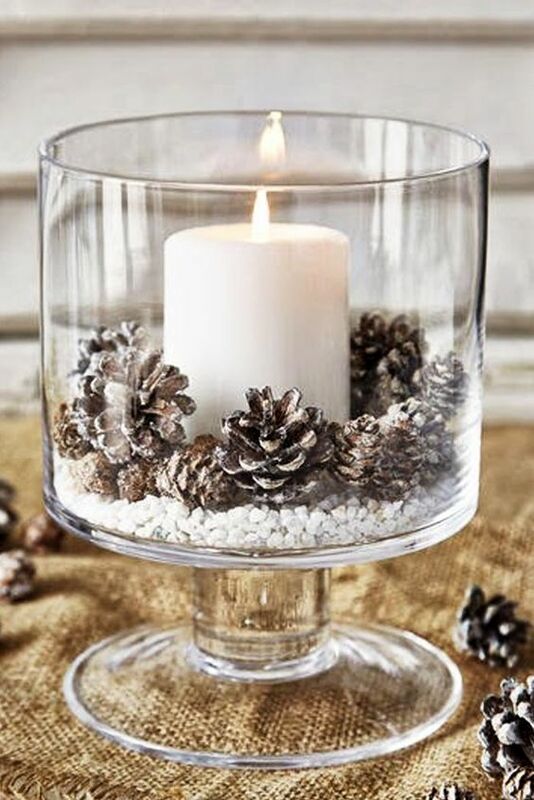 Just place a bunch of different size pine cones in a large hurricane vase holding a simple block candle in the middle. 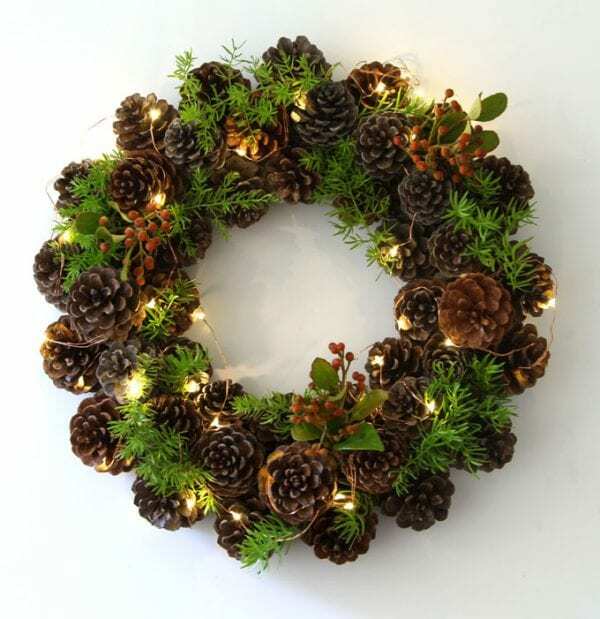 This candle ring is superb for a farmhouse style table or any holiday gathering! The cranberry colored scented jar candle in the middle is the perfect finish. These large Maine pinecones are wrapped double around a sturdy metal frame and painted in two different for a cheery look. I was impatient to share one of my most favorite pine cone Christmas tree crafts! Fragments of felt fabric, wooden balls, and wool roving gussy up plain pinecones to make a merry ornament trio for your Holiday tree. Speaking of pine cone Christmas crafts, there are perhaps tons of various ways to make a wreath of pine cones, but I particularly fancy this one for its cheerful display of organic hues. You can either use fresh or faux evergreens and red berries for a fun final touch. 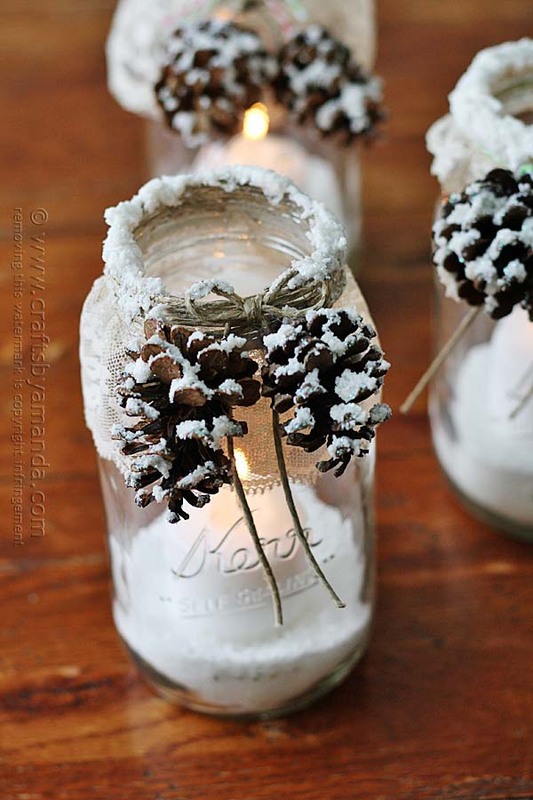 Can you imagine how easy is to make these stunning snowy pine cone crafts! These beautiful holiday luminaries, made of Mason jars, Epsom salt, and twine, appear to be covered with freshly fallen snow using snow texture paint! 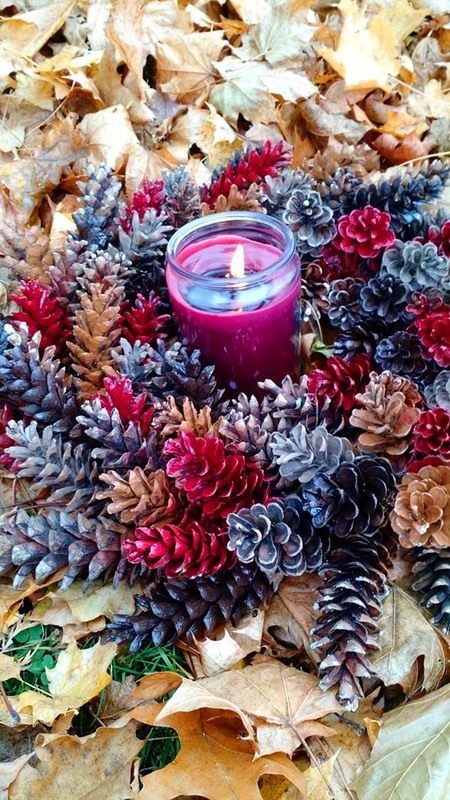 These symmetrically arranged DIY candle centerpieces, made of pine cones, are a great combination of rustic chic and sophisticated table setting. 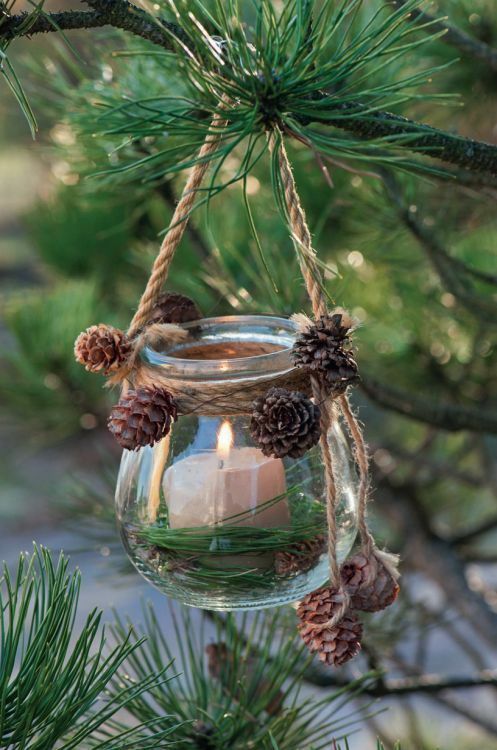 I’m sure you’ll love this fairy DIY candleholder made of decorative glass jars, tea lights and mini pinecones collected from the park nearby. The organic elements really pop against the glass and bring a joyful festive vibe. 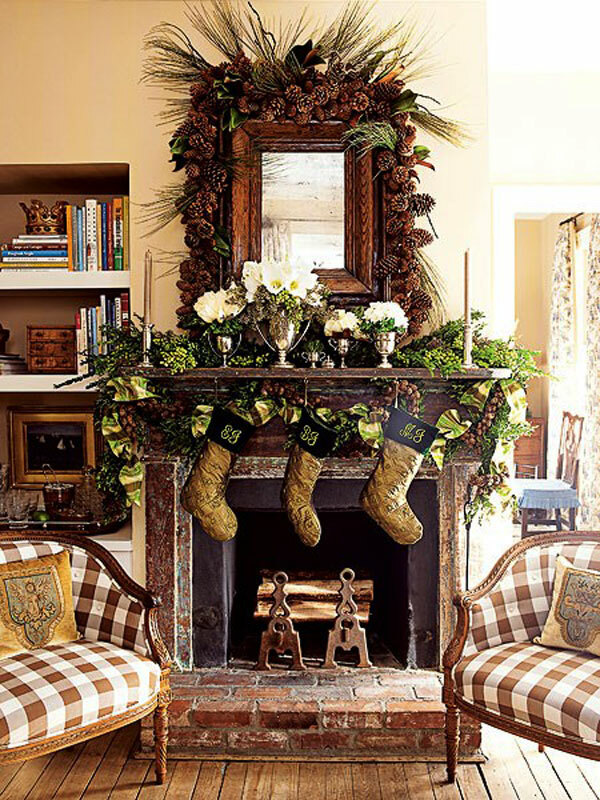 Why don’t you re-create this showy mirror frame above the fireplace mantel for a strong homey Christmas vibe? It will surely turn into the focal point of the living room space and catch each of your guest’s eyes. 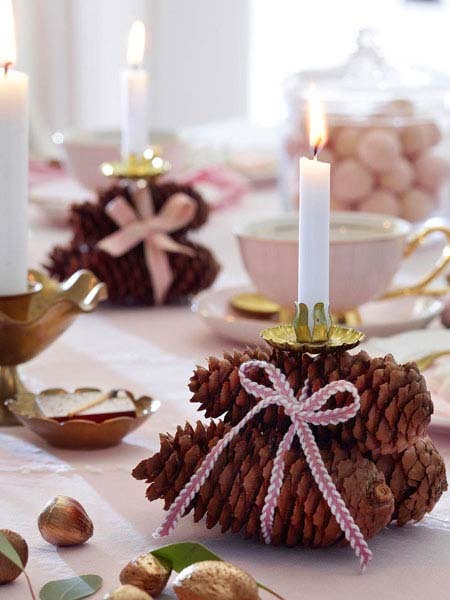 The pine cone arts and crafts are always a great idea for the Christmas dinner table mainly because they don’t take too much space and they look understated and yet elegant and eye-catching. Take a look at the DIY table centerpiece on the picture above to get some inspiration! 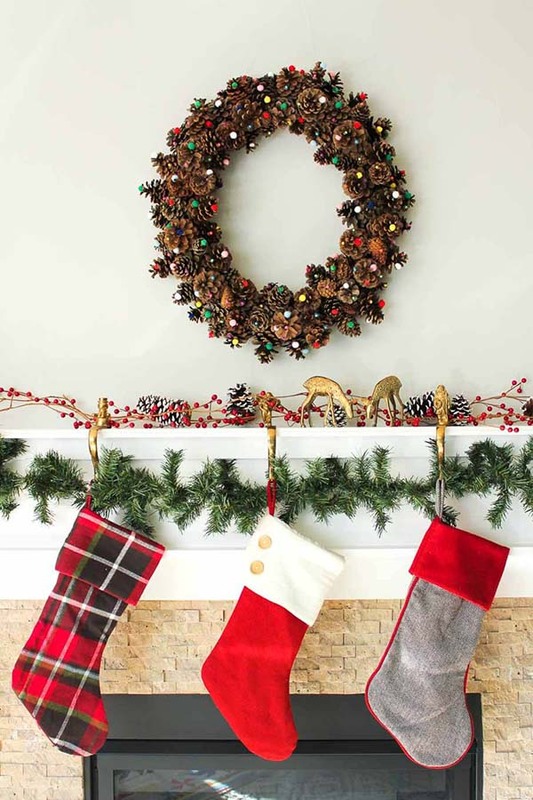 This DIY Christmas project is very simple and yet fun and spectacular. Do you agree with me? The pinecones give a hearty dose of natural texture and serve as a backdrop for the lively, colorful pom poms. 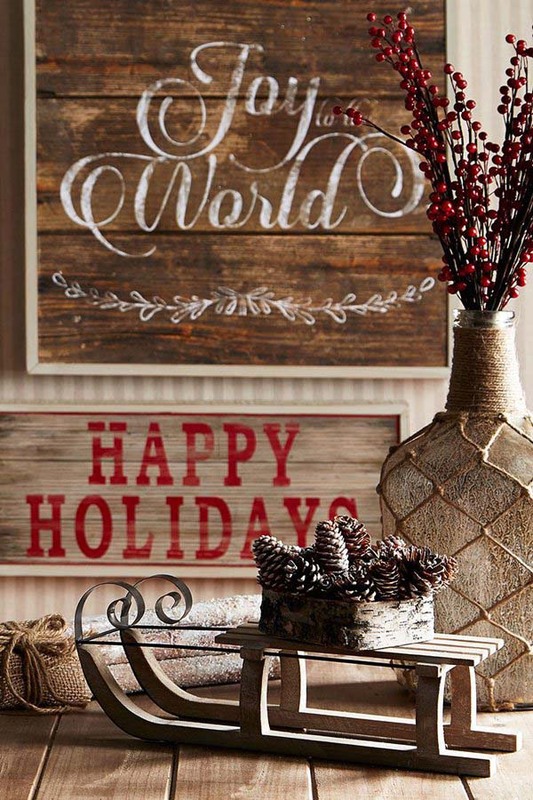 Every single element of this holiday setting, from the wooden wall art to the vintage sled, scream rustic. The entire holiday setting is quite understated, unpretentious and stylish. Also, I think this is a great decoration idea for many family occasions, not just for Xmas. When you’re decorating the interior, do not ignore the exterior such as the front porch because this is the first thing your guests will see. 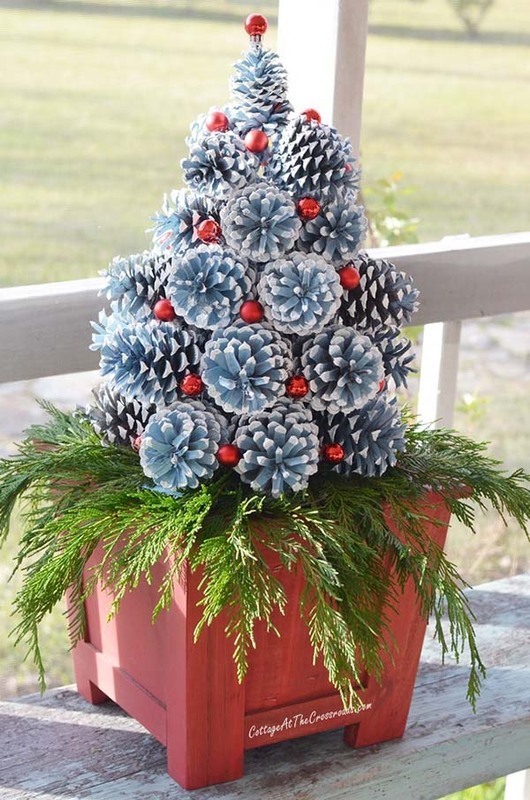 Make a large front porch Christmas tree by using a showy red planter and some pine cones painted in icy blue color for a wintery look. 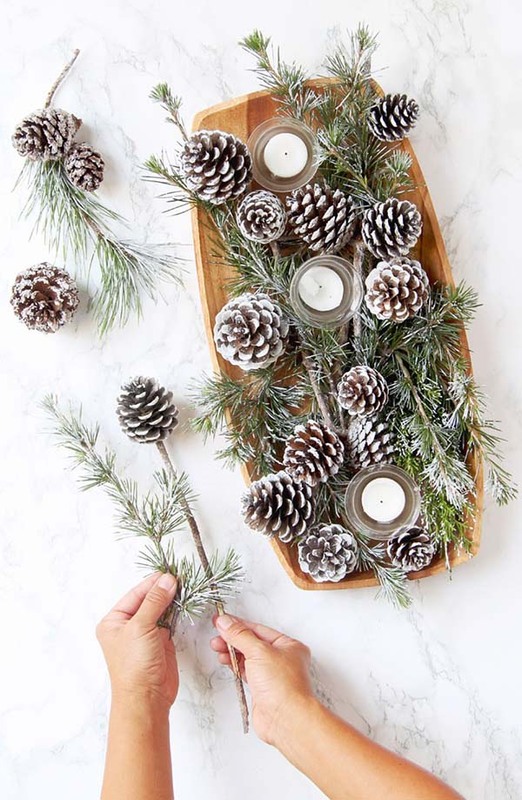 One of the easiest pine cone Christmas crafts, these artificially frosted (using Epsom salt) pine cones and evergreen branches would be a beautiful addition to every festive dinner table. This DIY craft project is ideal for the whole family and can be displayed in Mason jars or large wooden tray. 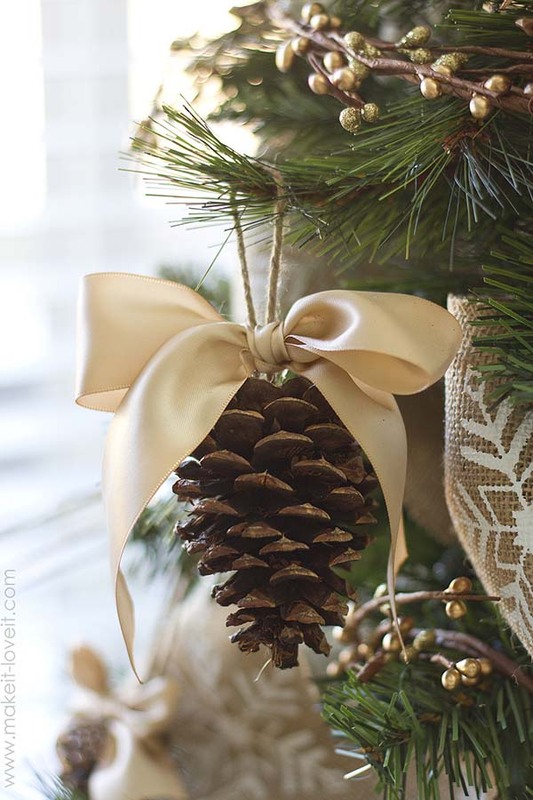 Strap single pinecones, painted with gold paint or left plain (like in the picture above), to ribbons of different lengths. 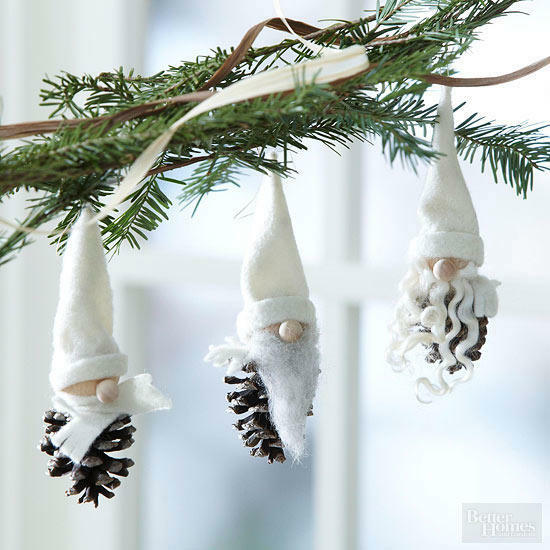 Hang these pine cone crafts on the Christmas tree for an exciting effect, or hang them from an outdoor porch light. So far, you saw that with a little imagination and creativity you can make wonderful DIY pine cone crafts for the next holiday! 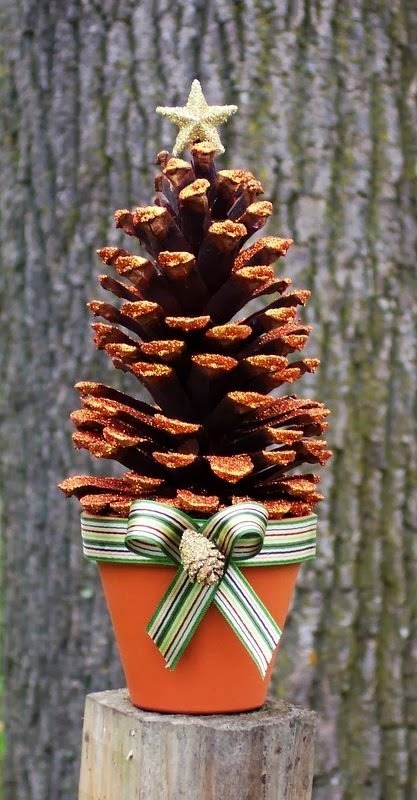 If you want to make all your neighbors envy you, create a shimmering pinecone tree in a pot and display it on the front porch. 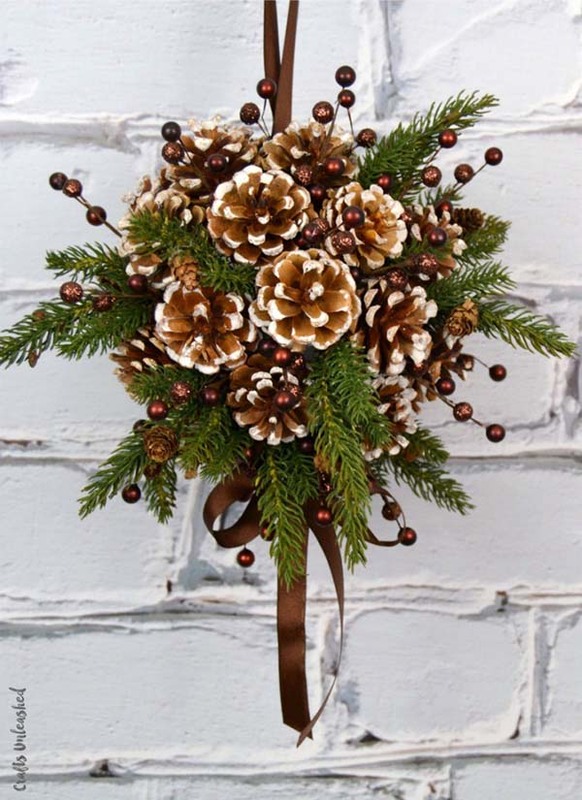 Welcome your holiday dinner party guests with an exciting festoon of gathered different size sugar pinecones and lichen-covered twigs emphasized with holly and other evergreens, some right from the yard. The festive plaid flannel ribbon is an essential element of this beautiful Christmas setting. 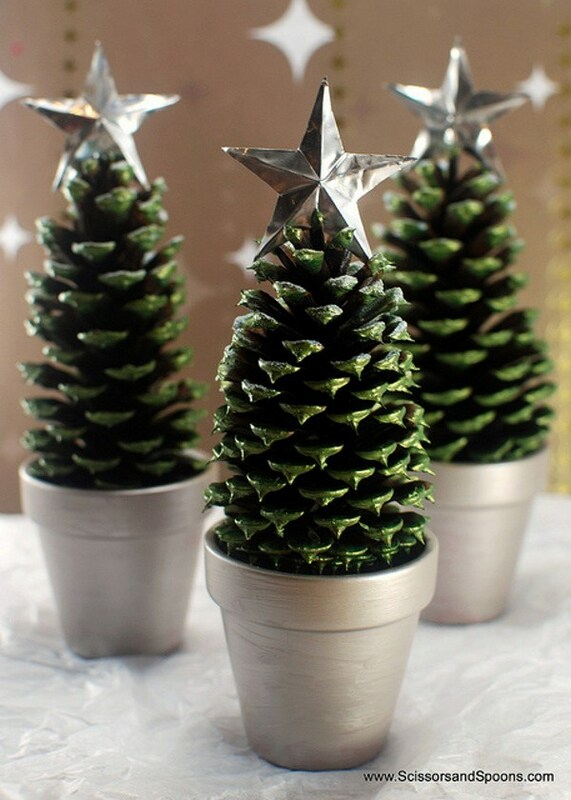 These pine cone Christmas tree crafts are insanely simple and cheap to make! You can get kisses under the pinecones when you display this impressive DIY kissing ball craft as part of your holiday decor. Friendly tip: It’s better to use some invisible fishing line to keep everything in place through the whole winter season. 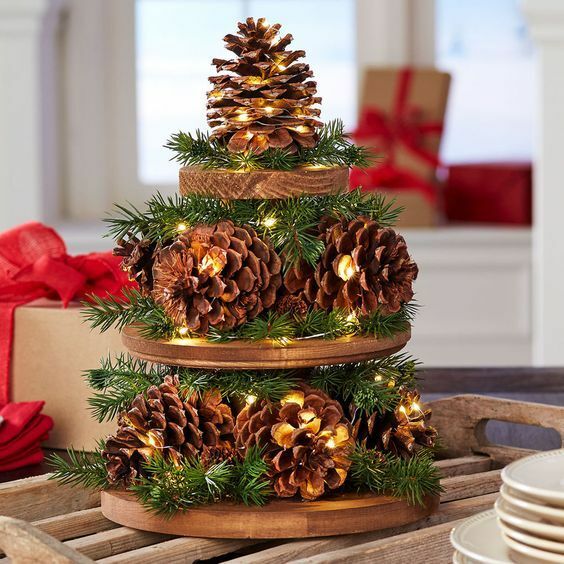 If you have a two-tiered cake stand you don’t use very often, make this beautiful pine cone arrangement that would ideally fir any living room or kitchen space. The string lights add an extra glitz to the setting. Ideal for master DIYers, these attractive rustic Christmas trees are made with extra large pine cones displayed in tiny pots. 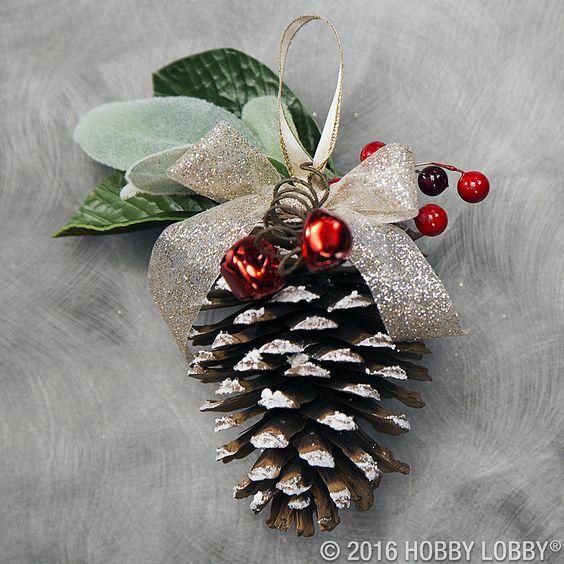 The cute metallic stars used as Christmas tree toppers are turning into the accent of these festive large pinecone crafts. 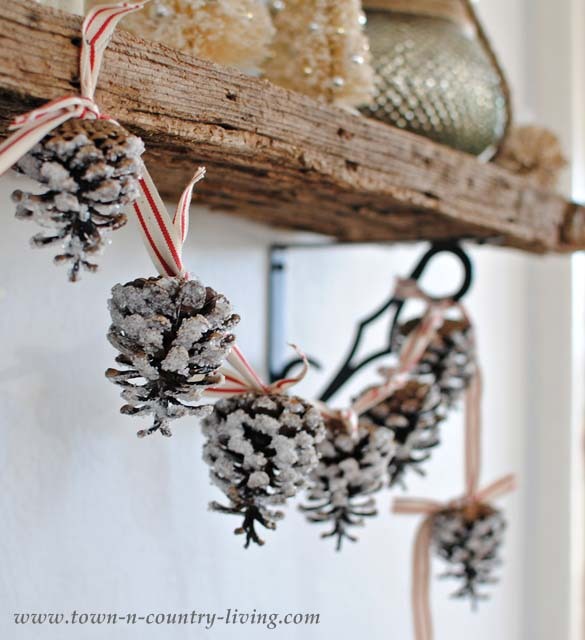 This handmade lush pinecone garland adds a touch of rustic woodland vibe, and in the same time, looks very bright and glamorous thanks to the glitter (made of Epsom salt and Mod Podge). The ribbon makes a cute contrast with the snowy pinecones.